Our Middlesbrough Reads campaign is working with Middlesbrough’s School Readiness team to promote the benefits of singing to newborn babies with the launch of a new nursery rhyme booklet. 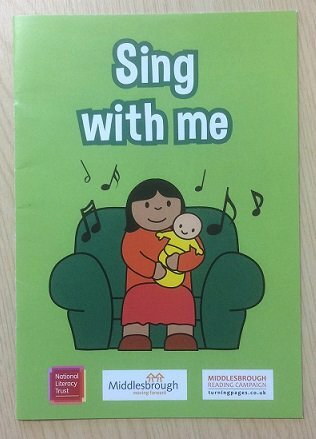 To coincide with World Nursery Rhyme Week this week, the Sing With Me booklets are reminding parents of the importance of sharing songs and rhymes with babies, and reacquaint them with some of the most familiar nursery rhymes. The booklets will be given to all new Middlesbrough parents by their health visitor at the six to eight week health check. Research shows that singing songs and rhymes at home has a positive impact on a child’s literacy skills as they grow older. The rhythm and repetition in nursery rhymes helps young children develop the language skills they need to learn to talk. Singing is also recognised as a great way for new parents to bond with their babies. Middlesbrough Reads has made raising the town’s literacy levels a priority since 2013, with a focus on children in the early years. Books are already gifted at antenatal classes and more than 600 story packs have been shared with parents of premature babies on the neonatal ward at James Cook University Hospital. Since the campaign launched, the percentage of children in Middlesbrough achieving the expected level in communication and language at age five has increased from 55.4% in 2013 to 72.7% in 2017; double the rate of national improvement. “We’re delighted to launch our new Middlesbrough Reads Sing With Me booklets which will be given to every Middlesbrough parent and their baby. The town’s youngest residents will love hearing rhymes over and over again and joining in with the actions when they’re a bit older.